With the playoff spots all decided, the Royals had nothing to play for except pride. 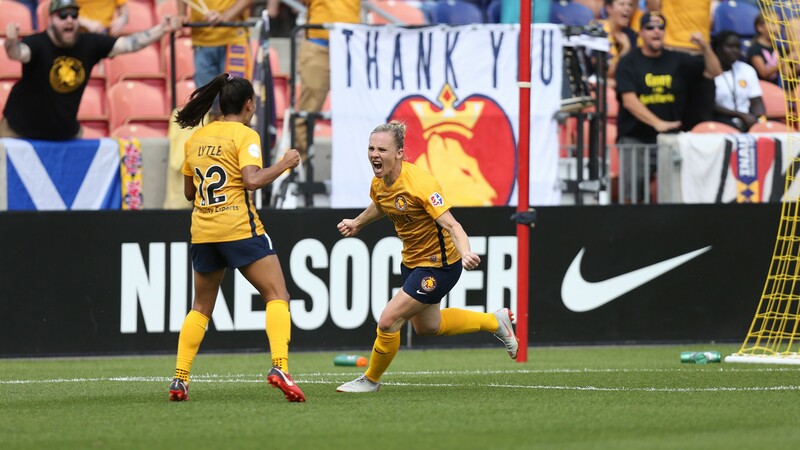 Utah Royals FC: Barnhart: Bowen, Corsie, Sauerbrunn, Moros; Scott, Jónsdóttir; Press (Tymrak, min. 85), Stengel, O'Hara (Lytle, min. 46); Rodriguez (LaBonta, min. 79). Chicago Red Stars: Naeher; Elby (Brian, min. 67), Naughton, Gorden, Gilliland; Stanton (Colaprico, min. 75), White (Green, min. 75), Vasconcelos; Yugisato, Kerr, Mautz. SCORE: 0-1, min. 39, Kerr. 1-1, min. 55, Rodriguez. 2-1, min. 64, Stengel. REFEREE: Rosendo Mendoza (USA). Yellow Card: Gilliland (min. 17), Stanton (min. 25). The National Women's Soccer League regular season ended this past weekend for Utah Royals FC and the Chicago Red Stars. Utah ended their inaugural season just missing out on the playoffs while the Red Stars have a playoff date with the North Carolina Courage coming up soon. 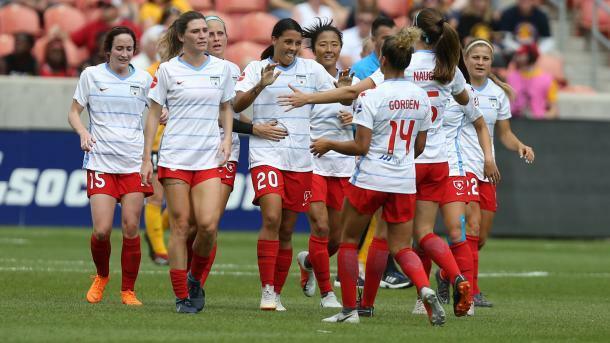 The Red Stars rested many of their starters but Sam Kerr was inserted into the starting lineup by head coach Rory Dames as the Australian bid to become the Golden Boot winner for this season. It worked as in the 39th minute, Arin Gilliland got forward and found Kerr with a great cross into the box and the striker nodded home her 16th goal of the season. Utah tried to get something going in their attack but could not put together enough passes to trouble a makeshift Chicago backline. 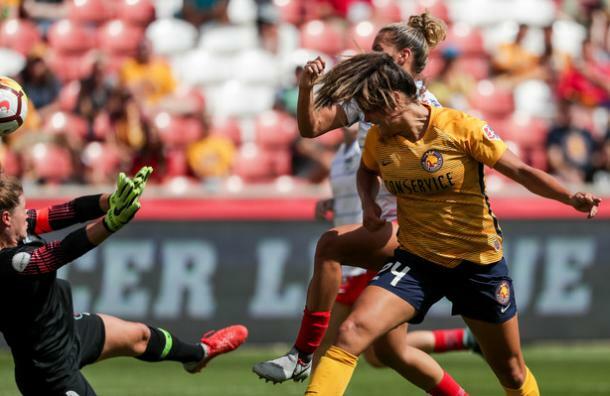 Even with the likes of Kelley O'Hara, Christen Press, Amy Rodriguez and Katie Stengel all on the field, Utah barely troubled Chicago's goalkeeper, Alyssa Naeher. The second half was a completely different story. With Taylor Lytle coming in for O'Hara, the Royals changed their tactics and it paid off. Rachel Corsie was the first to test the Red Stars backline but her effort went over the net. That was a sign of things to come however as Utah pushed to end their season on the right note. A good bit of play led to Katie Bowen picking out an unmarked Rodriguez inside the 18-yard area and the Royals forward watched her volley hit the post before bouncing inside the goal. Katie Stengel then scored the game-winning goal in the 64th minute, ending Chicago's seven game unbeaten streak. Lytle picked out the target forward with a cross towards the far post and Stengel headed the ball past Naeher's diving effort. Both teams continued to test the goalkeepers here and there but Stengel's goal proved decisive as Utah finished their season with a win in front of a strong crowd showing.